Many sport clubs are looking for ways to increase the attendance figures at home games against especially less attractive opponents and at off-peak times, and furthermore to gain higher revenues at top matches. Dynamic Ticketing and Variable Pricing are two approaches of how to create the ticketing more demand orientated and therefore more target-oriented. Nowadays only a few major league clubs in the US use Dynamic Ticketing. As it requires comprehensive consumer data and a heavily customised IT system developed for the case of the specific club, Dynamic Ticket is basically not yet implemented by clubs in Europe. A more simple approach, compared to the aforementioned one, is called Variable Pricing. This strategy takes factors like demand and attractiveness of the game into account. Commonly a Variable Pricing strategy divides the totality of games per season into two or three categories, each representing teams with the same projected attractiveness and demand, based on the two factors attractiveness of the opponent and timing (e.g. weekend vs. weekday). 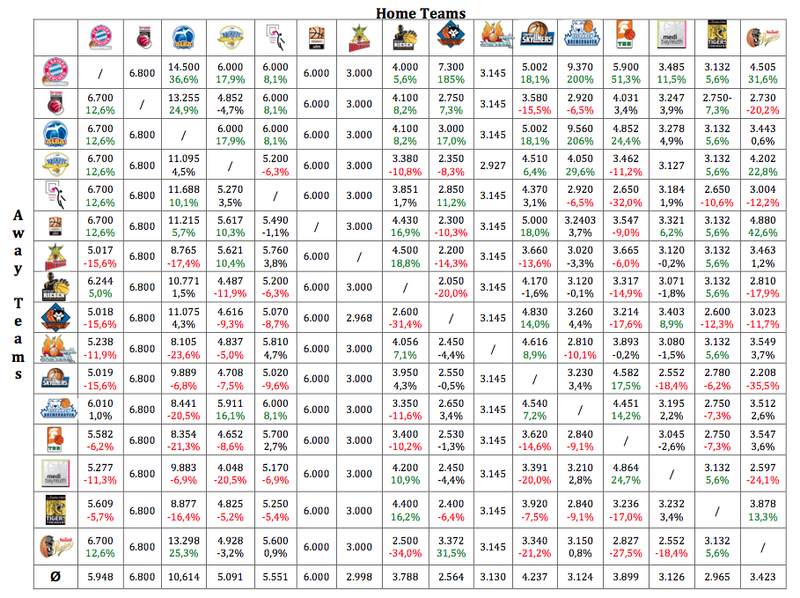 The following framework shows one approach of how to determine the attractiveness of away teams for the case of the German Basketball Bundesliga, the Beko BBL.The figure below gives an overview about how many spectators the individual away teams (rows) attracted during the Beko BBL season 2013/14 when playing at home games of the host teams (columns). The figures are based on the official data given by the Beko BBL (http://bit.ly/1wqLnCT). Each of the given percentages indicates the ratio between the average attendance of the individual home team and the concrete attendance at the concrete game. The colours red and green indicate whether the away team attracted an attendance of less than 5 % compared to the home team’s average, or the away team attracted an attendance of more than 5 % compared to the average of the home team. The example of the FC Bayern Munich shows that every given percentage is green, what indicates that more spectators came to see their home teams playing against the FCB than spectators come in average to the home games of their clubs. 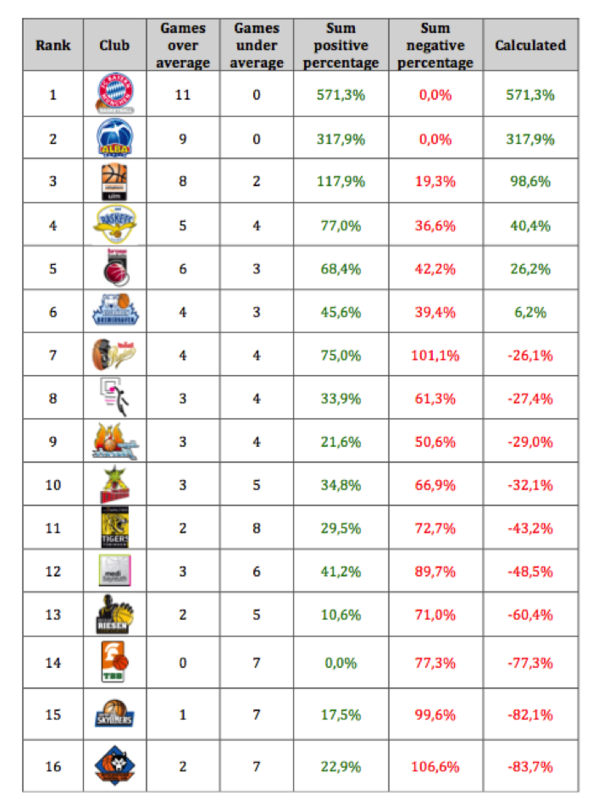 The next figure summarizes the findings of the table above into an overview about which Beko BBL teams could be described as attractive opponents and which as less attractive opponents. Column three shows at how many games the individual away club attracted more spectators than the normal home game average, and column four shows the opposite, thus games on which they attracted fewer spectators. Column seven calculates the summed up positive percentages and negative percentages to a final figure of how attractive the respective club as a guest team is. All figures coloured in green indicate attractive clubs whereas all red coloured figures indicate less attractive clubs. The framework used in this example could be adapted for more or less every sport and used by sport marketers to determine the demand for every encounter of the season and build therefore the basis for further marketing measures, for example a Variable Pricing strategy.